A pair of top Democrats urging a ban on plastic bags by New York retailers could not have gained a better “prop” for their Saturday morning press conference. County Executive Mark C. Poloncarz and Assemblyman Sean M. Ryan only had to point to Delaware Park’s Rose Garden and a plastic grocery bag caught in the rosebushes. 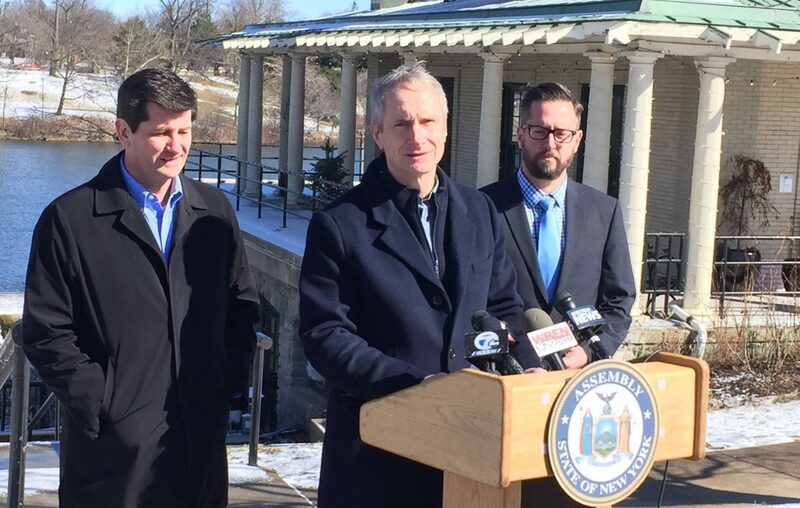 That bag and more than 20 billion others used throughout the state each year, Ryan and Poloncarz said, are causing serious problems and the new budget waiting approval in Albany should mandate the end of their regular use. With an April 1 deadline for budget adoption looming, the pair called on the Legislature to follow through on Gov. Andrew M. Cuomo’s proposal to ban plastic bags that never fully decompose after an average use of about 12 minutes. They also want Albany to enact a 5 cent charge on use of paper bags that require more water and energy to manufacture than plastic bags and use more than 14 million trees each year to make. “We can’t fix the world’s use of plastic bags, but we can start with the 20 billion that we are currently using in New York State,” Ryan said, pointing to major reductions in their use following bans in cities like San Jose and Washington. “Such measures work,” he said. A ban would apply to all stores, all retail and all restaurants, the assemblyman said, adding that his proposal would funnel the 5 cent paper bag fee into the state’s environmental fund. “We need to focus on making reusable bags part of our daily life,” he said. “A couple of years go by and you don’t think of it,” he added, pointing to the gradual and now almost universally acceptance of seat belts after initial opposition to their mandated use. Poloncarz joined the Saturday effort by pointing to the practical benefits of a plastic bag ban. Erie County crews are constantly unclogging sewer drains and lines, he said, requiring continuous attention and unnecessary work. Poloncarz said while county efforts to ban plastic proved unsuccessful, a statewide law will prove far more effective. Brian Smith, associate executive director of Citizens Campaign for the Environment, appeared with Ryan and Poloncarz to add his group’s endorsement. He said the “scourge of plastic bags” has contributed to Great Lakes pollution — about 5.5 million pounds in Lake Erie alone each year. They also cause between $300,000 and $1 million in damage to recycling facilities across the state each year, he said. “As a society, we can no longer afford the single use plastic bag and it is time to ban them,” he said. Ryan’s proposal to couple the plastic ban with a fee on paper bags appears to mirror one recently advanced by the State Senate in its budget negotiations. He said most of the discussion now centers around the nickel charge on paper bags, noting the Assembly remains wedded to direct deposit in an environmental fund, while retail lobbyists are also seeking some type of compensation. The grocery industry has pushed back against the idea in recent years, with Wegmans telling The Buffalo News in 2018 that education and recycling also proves effective. Wegmans also noted that plastic bags are made of recycled plastic and natural gas, are lighter than reusable and paper bags and take up less space, requiring fewer trucks and fuel to transport. Wegmans’ plastic bags are made from 40 percent recycled plastic, and its plastic bag recycling rate averaged nearly 50 percent in 2017, the company said.